Do you participate in cycling events? I raced superbikes for several years. That ended with a head injury. It doesn't matter how careful you are. Your potential demise is out of your control. But I was in it to win and that's a test of wills as much as it is skill and concentration. It's exhilarating when it works. A high like none other. Sometimes it's hard to not be distracted by how good it felt comming off the last turn - except preventing getting passed in the next one happens NOW. Anyone doing cycling events these days? These events are all fairly close by - 10-15 miles from my house. I've found that it works well to just get up pretty early and ride nice 'n easy to the event - a good warmup. If I still have energy, I can push it on the way home - if not, I can take it slow. On the one gravel ride, everyone ran out of water and nearly overheated. I probably could have hitched a ride in a vehicle, but fortunately, two other riders also rode to the event, so we pacelined it back to town. I think it's great you're doing events. We were doing events last summer ... a 200K in February and a 300K in early March. And the 200K was followed by a car free cycling week as well. But then Rowan's accident ... and winter ... happened, and it will probably be a while before we do much in the way of cycling events. Hopefully we'll be back into it again, at least a little bit, next summer. I've been following Rowan's injury on the other thread - his progress has been amazing! I'm sure the two of you will be doing events again soon! 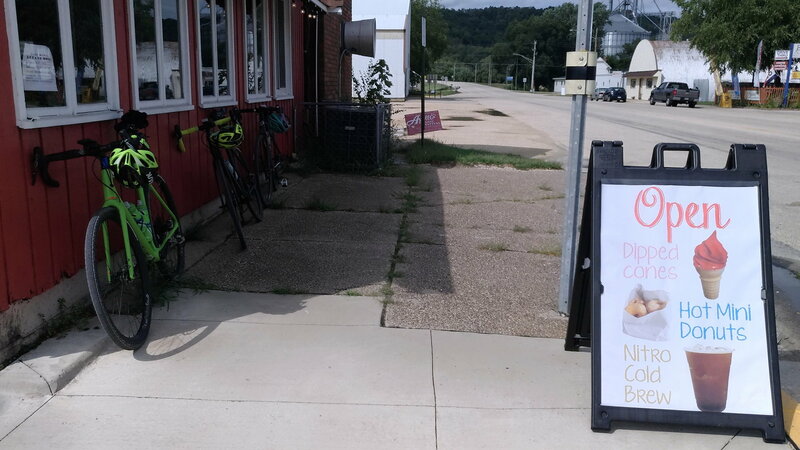 Fun event last weekend: the Hokah Hilly Hundred, which is the first event in the brand-new Driftless Gravel Enduro Series. The ride itself was ~67 miles, and riding to and from the start added ~20 miles. I let the "fast group" go do their thing, but the slow group was a bit too slow...so I rode on my own for a little bit, and then rode for a while with a regular riding buddy who is slower than me on climbs but faster on descents (so about even). At the rest stop we collected a few other riders, and had a fairly nice moderate group of 5-6 heading back to the finish. I've promised myself (and my significant other) no racing because I have a nasty competitive streak, and there's always going to be someone who works harder, has better equipment, and is just a better athlete. These kinds of events are more my speed! One more event: the Mini Donut Gravel Enduro. This time, the start was only about a mile from my house! We'll get back into the events again ... maybe next summer.